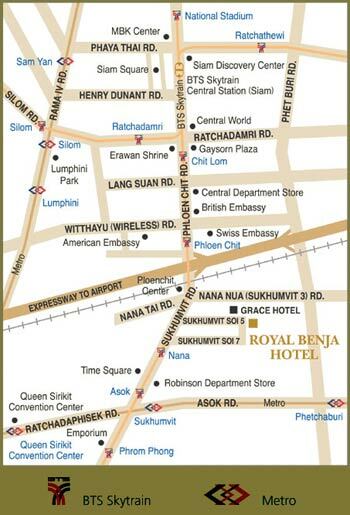 Situated on an ideal location of Bangkok, Royal Benja Hotel has a definite advantage of transportation in and out-bounds. We are close to and can easily reach major business centres on Sukhumvit Rd. and Silom Rd. as well as many famous shopping areas of the city. Aside from being provided with the BTS skytrain and MRT underground services, which enable our guests to hop around without traffic, Royal Benja is only 30 minutes away from Suvarnabhumi Airport by using the main expressway, which also leads you to the Eastern provinces such as Samutprakan, Chon Buri and Rayong in a short time.